Jamaica's architectural heritage is one of the most tangible and diverse examples of our people's creativity and skills. 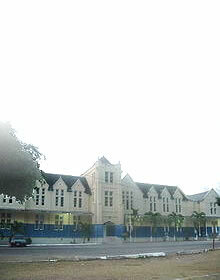 The architectural heritage consists of buildings such as churches, schools, public buildings, industrial structures such as aqueducts, plantation houses and small vernacular houses among others. The Estate Management & Business Development Division's main function is to manage, monitor and in conjunction with the Communications Division, promote the heritage sites under the responsibility of the JNHT. It is also responsible for the assessing and approving of development proposals where they impact on declared and designated heritage properties. To assist in the approval process there is a Heritage Architectural Review Board was established, consisting of qualified architects, archaeologists and technical support staff of the JNHT. This Board sees to it that the integrity of historic sites, buildings and districts is maintained; and that the preservation and development our historic sites proceed in a sensitive and systematic manner. 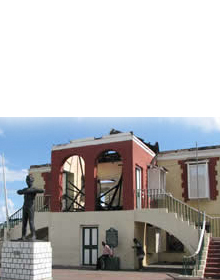 The JNHT has five heritage districts across the island and over 100 declared heritage sites. In addition, there are hundreds more of historic interest. The monitoring of restoration and development activities at heritage sites and within heritage districts. 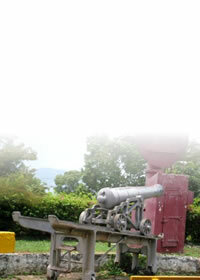 The maintenance and upkeep of sites under the management of the Trust. Rental and licensing of properties of sites under the management of the Trust. The leasing of properties for their development, management or maintenance. The production and sale of souvenirs specific to the properties under the management of the Trust. The satellite sites managed by the Division are the Seville Heritage Park, Fort Charles and the Historic Naval Hospital, Blenheim, Roxborough, Stony Gut and Mountain River Cave.